Before starting any home improvement project or major repairs, please contact the Department of Planning and Community Development’s Building Inspections Division at 540-432-7700 to determine if your project requires a permit and inspection. Any structural changes, such as adding or removing walls, require a Building Permit. Any electrical work requires an Electric Permit. Any new or relocated plumbing fixtures require a Plumbing Permit. Replacing a fixture with a comparable fixture does not require a permit. Any work involving a gas line requires a Mechanical Permit. If you wish to add an accessory structure (shed, garage, etc. ), make sure you are meeting the Setback requirements for your zoning district. Setbacks are the minimum distance by which any building or structure must be separated from all lot lines. Contact the Department of Planning and Community Development’s Planning and Zoning Division at 540-432-7700 to inquire about your property’s setback requirements. If you wish to start a home business, make sure you are meeting the Home Occupation requirements. If you rent or lease a property, verify Occupancy requirements which limit the number of unrelated persons living within a dwelling. 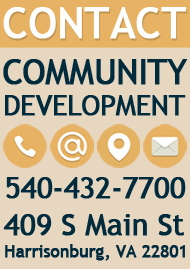 Contact the Department of Planning and Community Development’s Planning and Zoning Division at 540-432-7700 to inquire about your property’s occupancy requirements. Information about pets and chickens. 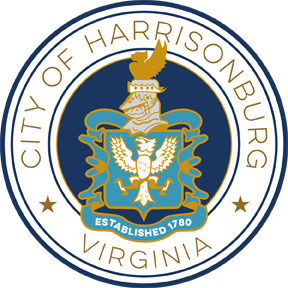 The Zoning Ordinance of the City of Harrisonburg outlines the regulations governing the use of the buildings and property, the heights of building, the size of yards, setbacks, and more. Any time you wish to add or change any structure on your property or change how you use your property, please call the Department of Planning and Community Development’s Planning and Zoning Division at 540-432-7700. Tall grass and weeds must not exceed 12 inches in height in most districts.